Aspen White Granite is one of the all-time favorite granite countertops. Adding it to a kitchen presents a superb way to boost monetary and aesthetic value of your home. It will add patina to it as well. 1 Aspen White Granite Countertops – Why Choose Them? Aspen White Granite Countertops – Why Choose Them? Have you ever wondered what would be the best and the easiest place for a kitchen focal point? Many homeowners and interior designers choose kitchen countertop to be the one to steal the show. 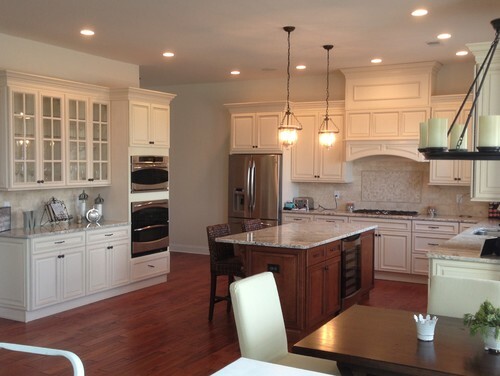 It’s usually considered that the cabinet color dictates the color of kitchen countertops. The truth is that some granite countertops live their own lives. They are capable of enriching any kitchen design. Whether your kitchen is dark or white, modern and minimalistic or traditional and rustic, Aspen White Granite countertops will put a final touch to its design. This granite will make it complete. 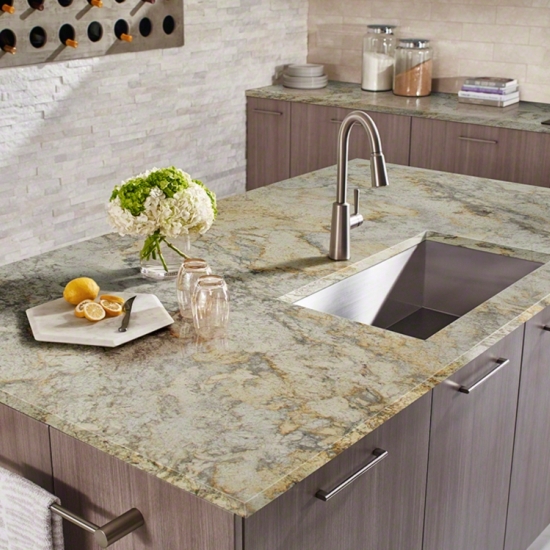 This is why Aspen Granite is one of the most popular granite colors. 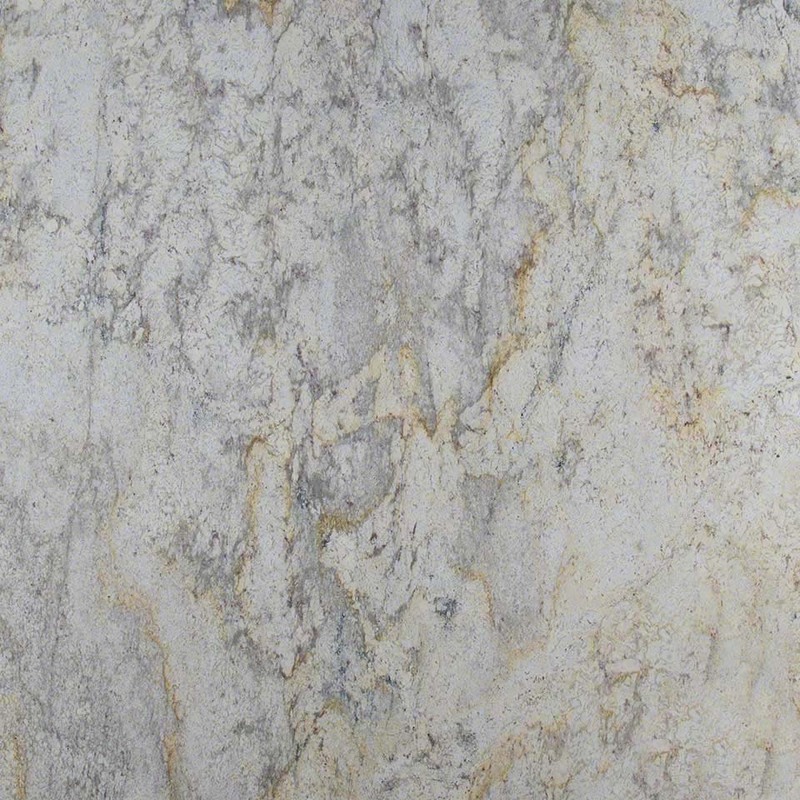 Cool white shades and neutral grays are complemented with warm gold veins in this gorgeous granite. Depending on a slab, Aspen Granite countertops can have a more dramatic black and white look with high variations and veining. Whether you opt for polished, honed or sawn finish, these attributes make Aspen White countertops a natural stone that is one of its kind. It is ideal for different design styles in any kitchen. This stone gives a clean, sophisticated look or contrast and interest and the final look depends on the slab. 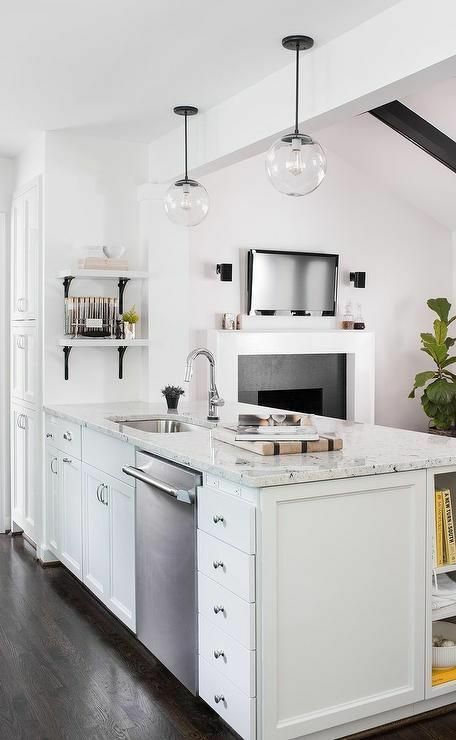 For those who appreciate the ever-appealing, clean white in a kitchen, Aspen White Granite countertops are a more reasonably priced alternative in comparison to marble. Granite slab prices will never break your bank. They are equally stylish but much more resilient than marble. No matter what granite countertop colors you settle on in your kitchen, be sure that they’re going to demands less maintenance compared to marble. Aspen White Granite kitchen countertops will always look unique. They are also versatile and go well with any kitchen style – modern and traditional. You’ll be surprised how each slab looks differently. Depending on the prevailing variation of flecks and veining in a granite slab, Aspen White granite slab can add more class and sleekness to your kitchen. It can soften up the edges and bring more coziness to an all white kitchen. All in all, this granite guarantees originality in a kitchen. Here are some Aspen countertop slab images to inspire you in creating a timeless kitchen you will always enjoy. Aspen White Granite slab adds interest to this traditional kitchen with raised panel and pendant lights. The granite countertops create the perfect balance between white glass backsplash, light cabinets, dark laminate floors and a kitchen island. 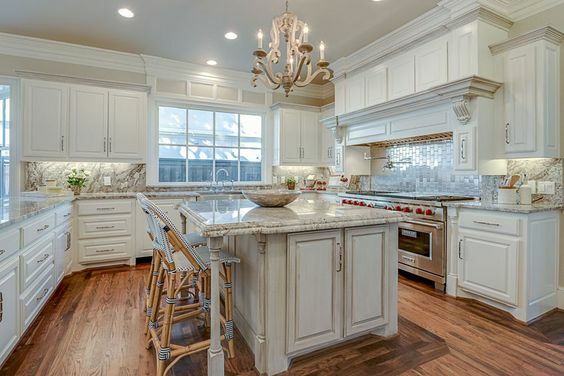 This lovely kitchen features a white peninsula topped with white granite. The peninsula is fitted with a gooseneck faucet and a stainless steel kitchen sink. It is placed next to a dishwasher made of stainless steel and under shelves with iron corbels. The whole design is lit by clear glass globe pendants. Aspen White Granite slab adds interest in this white kitchen. It helps the dark kitchen island and stainless steel appliances to create contrast. It balances the dark and the light in this kitchen design. 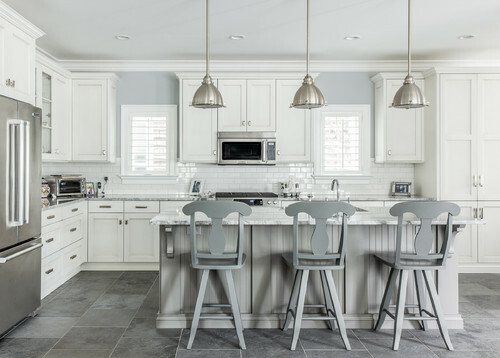 Of all the different granite countertop colors and variation slabs, white granite is probably the best neutral option to complement white and gray kitchen combinations and still leave enough space for adding more details. 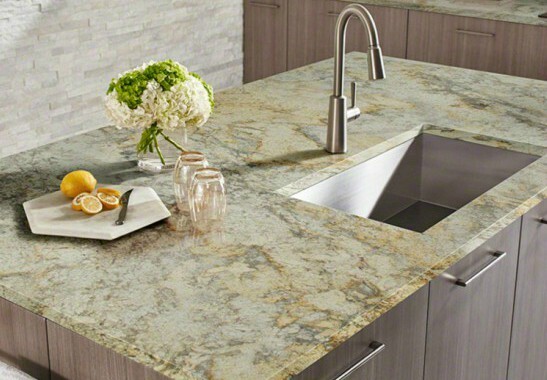 Gray veining in this granite slab makes it a perfect addition to this well-balanced kitchen. 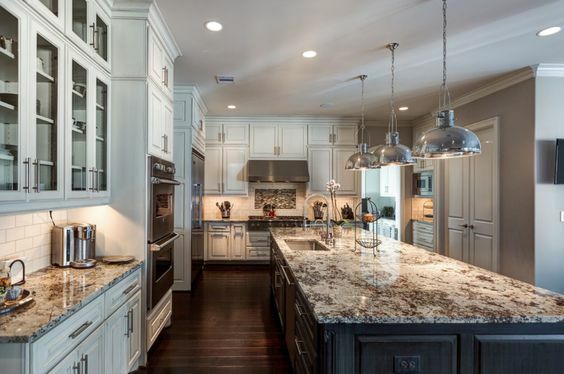 Traditional kitchen with white kitchen cabinets, Aspen White Granite countertop, and breakfast bar shows an original way to create the perfect gathering spot for family and friends. Using the same granite for the backsplash makes you feel like having a breakfast in a million dollar kitchen. Among many pictures of granite countertops, we believe the next one shows the best the effect of Aspen White granite slab and its gold veining flowing throughout the stone. Granite slabs with the perfect, natural pattern of grays and whites make the kitchen countertops and the island a wonderful focal point of this kitchen. We showed you how Aspen White Granite kitchen countertops can complement a white kitchen and never bore you. Now let’s take a look at some examples of this stone when paired with dark kitchen cabinets. The various patterns in White Aspen Granite surface work quite well in contemporary kitchen designs with dark cabinets. This granite is the perfect solution if you wish to brighten smaller kitchen areas. The fresh white color gives the entire kitchen area an open, airy feeling. It will provide a welcoming atmosphere. If your cabinets are dark colored, then the installation of Aspen White granite kitchen countertop eliminates the “stuffy” feeling. When seeking a granite color that is capable of breaking up blocks of color, this golden veining stone with lots of whites is probably the right choice for you. Here is an example of a transitional kitchen with slab cabinets, an undermount sink, flush light, and a stone tile backsplash. 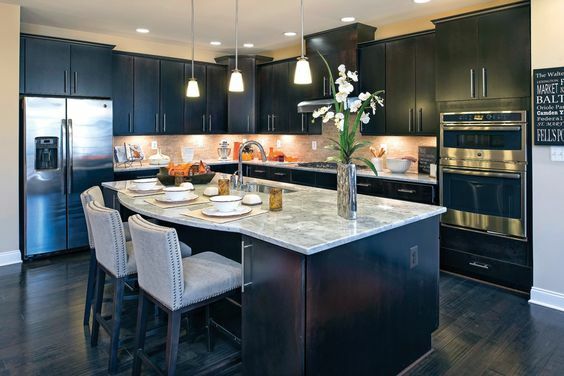 This beautiful dark kitchen design is complemented with Aspen White Granite. The whiteness of granite breaks the darkness of the kitchen with its shine. It enhances the sleekness and high-end style of the kitchen design. 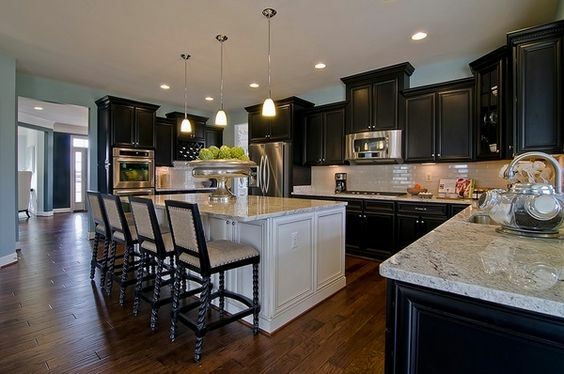 White granite countertop with high contrast looks striking in this all-black kitchen. It opens up the cooking space. 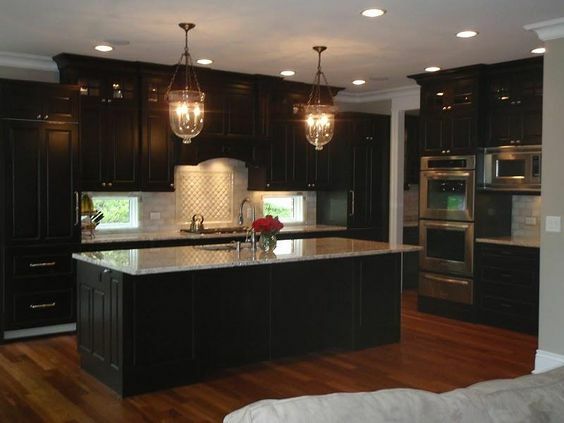 Not only that it doesn’t take anything from the elegance of the black kitchen cabinets – it adds up to it. Dark kitchen cabinetry with stainless steel appliances opens up to the rest of the home with the help of white kitchen island and modern white granite kitchen countertops. 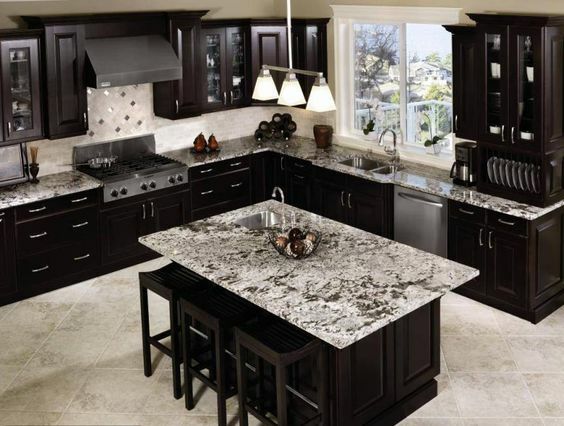 If you like black kitchen cabinets design, don’t be afraid to use Aspen Granite in it. 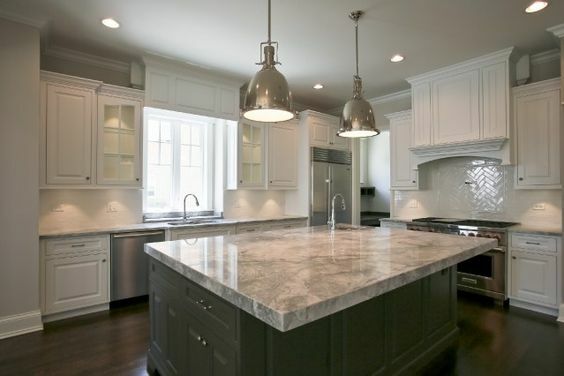 White granite along with bright backsplash breaks the darkness and brings in the light. The whole design screams elegance and class. Not only black cabinets can benefit from white granite countertops. 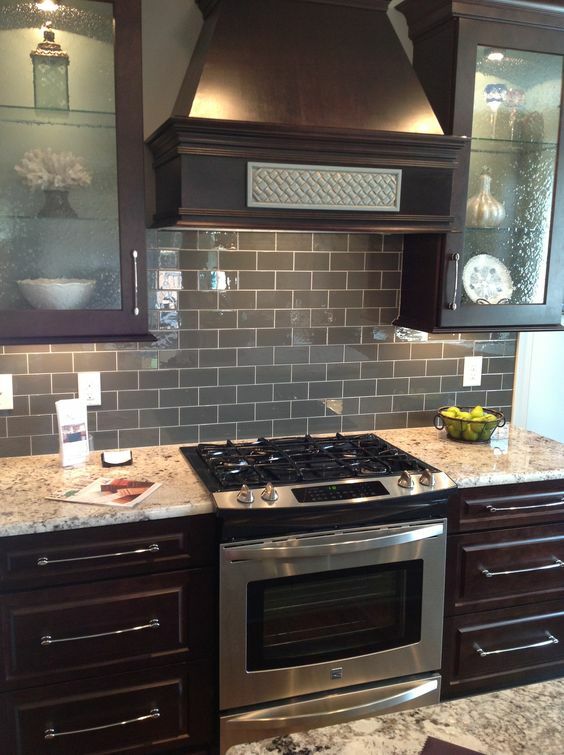 Dark brown cabinets get some shine from the gray glass subway tile backsplash and stainless steel appliances. White granite countertops are the key feature that opens up this kitchen design and adds interest to it. A lot of things can affect the cost of Aspen White Granite. When choosing this type of white granite, pay attention to what edging you’re looking for, as well as what kind of polishing you want. In order to get the best Aspen White granite cost, find a local wholesale granite place. Your local fabricator will most certainly do the fabrication and installation for free. In some cases, Aspen White granite installation will also probably come with a free sealer application and a free edge treatment. Having a good go-to fabricator will make your shopping process much more enjoyable. Depending on the fabricator, the Aspen White granite cost can go up to $60 per sq. ft. Be assured that every cent you pay for is worth it. 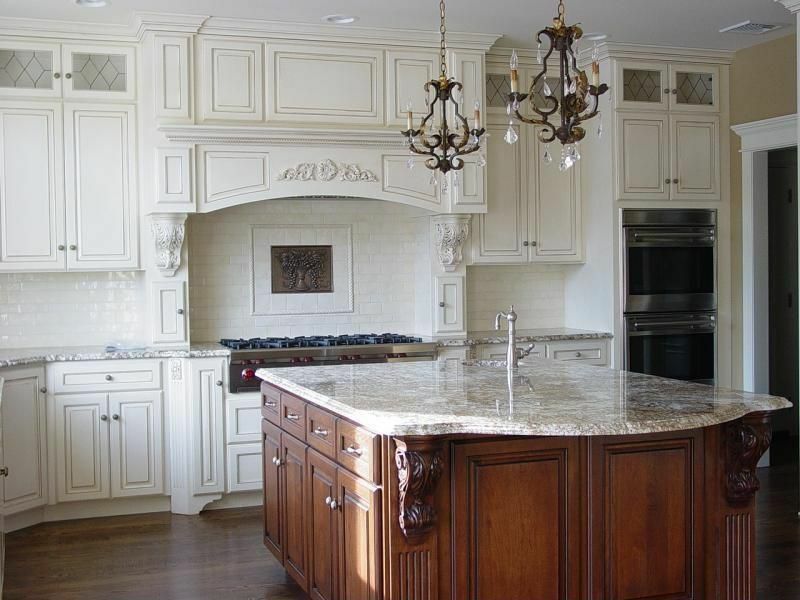 Aspen White granite countertops are one of the most luxurious granite countertops you can find. Aspen White stone is quarried in the Namibian desert. Blocks are shipped to Italy for slab processing since there are only a few factories in South Africa that have the right procession equipment. The background color always stays white. The movement and the veining vary from block to block. During stone polishing, an epoxy resin applies to its surface to fill in any eventual pits, cracks or fissures. This does not affect the durability or beauty of the stone. The granite slabs are book-matched. This means that slab one and slab two will be cut and polished to create a mirror image of each other. Have you wondered will your white granite countertop bore you in time? Well, no need for that. It won’t happen if you choose Aspen Granite. Other varieties of white granites will provide a similar effect. Each white granite countertop is different because each granite slab is completely unique. You’ll never find two same pieces of white granite even when they are of the same kind. The structure of granite kitchen countertops makes them exceedingly difficult to attain what most of us think of as a “pure” white color. The appeal of white granite is in its striations, variations, and flecks. They add essence and generate interest. White granite countertops come in different variations. This natural stone constitutes plenty of character. It comprises unique colors, grains, and customizable finishes. Beside Aspen Granite, a good choice for your kitchen may also be Bianco Antico Granite, River White Granite, or Ivory Fantasy Granite. White granite countertops are not less durable than any other types of granite. They might seem fragile because of their color. However, that is merely due to the softness of the whiteness. This effect of white is what actually makes these countertops even more aesthetically valuable. Dark flecks will enhance the soft feel in the hard granite and make it even more appealing. Designing a kitchen with class leaves a lot of room for interpretation. However, using white granite means providing an evergreen design in a simple way. Be sure white granite kitchen countertops won’t go out of fashion any time soon. Make your home warm and welcoming, as well as stylish and elegant with this timeless stone. For example, Aqua Kitchen and Bath Design Center has more than 100 stones color and more than 1000 slabs inventory. We are sure you would find the right white granite slab or Aspen White granite countertop for your kitchen. That is why you should check out the showroom of your local granite supplier today.